From Spinning Tops to Face Masks! Do you get tired of packaging waste? Why not make some cardboard crafts with the kids out of the empty cereal boxes, kitchen roll tubes, and any other cardboard you can get your hands on to turn into something creative! If that`s not your idea of fun, there are some great project kits you can pick up that are really easy to make with simple instructions. What can you make from paper tubes that will wow you friends? 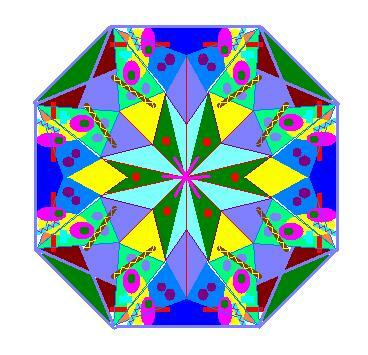 Quite a lot actually, but lets start with the classic kaleidoscope. 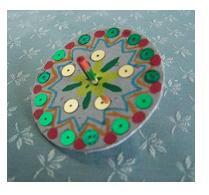 Make a kaleidoscope for cardboard crafts in 3 easy steps that you can turn at the bottom just like the tin oldies. One day Iain, James and myself were quite bored wondering what to do. So we came up with a brilliant idea to make cardboard spinning tops. Sounds great! So we found ourselves some really stiff board and got to work. The end result was three super spinning toys that could battle each other in an arena made from a wide shallow box or plate. Here is how to make our spinning tops, KKC style of course! You can transform those cereal boxes into other useful items so they earn their stay in your room. This next cardboard crafts project will help keep your room tidy of all the collages, drawings, and cards you plan on making along with us. We are going to make a Craft Organizer or you may want to call it an art file. You will need about 3- 5 cereal boxes, some glue, paint and stencils. Mums! Don`t ask silly questions why your child wants you to salvage the boxes. It`s for a good cause. We promise! You will love this next KKC idea. Who doesn`t like to put on a cardboard crafts home show extravaganza for mum and dad? But you can`t cheat and use ready made costumes although some of you will be tempted. The character masks are all hand made from cardboard cartons. What show will you put on? Puss in Boots? Cinderella? 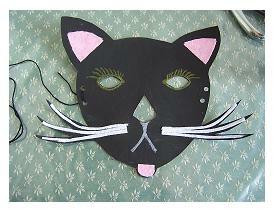 For making masks for all the characters use stencils and a little paint. Think of some clever dressing-up ideas, and voila you have your costumes for a Broadway show. If you want to get even more extravagant with your ideas, you can go about creating the stage backdrop. But for that you will have to hunt out some very very large cardboard packaging. Is there anybody buying some Ikea furniture anywhere in the neighborhood? You know what to do! Pssst...kids! I don`t think your mum and dad will let you keep the stage props. Who hasn`t tried making jigsaw puzzles? The pieces usually consist of squares cut from pretty pictures. Well we can do better than that, but we don`t have to go out and buy a jigsaw or a jigsaw puzzle making machine to make masterpieces. No! Not unless you`re thinking of going into business, then that`s another story. We are just at "cardboard crafts for beginners" stage. Good news! You can buy blank jigsaws! It`s true. All you have to do is provide the picture and that means getting the crayons out. Watch this space on how you do it.